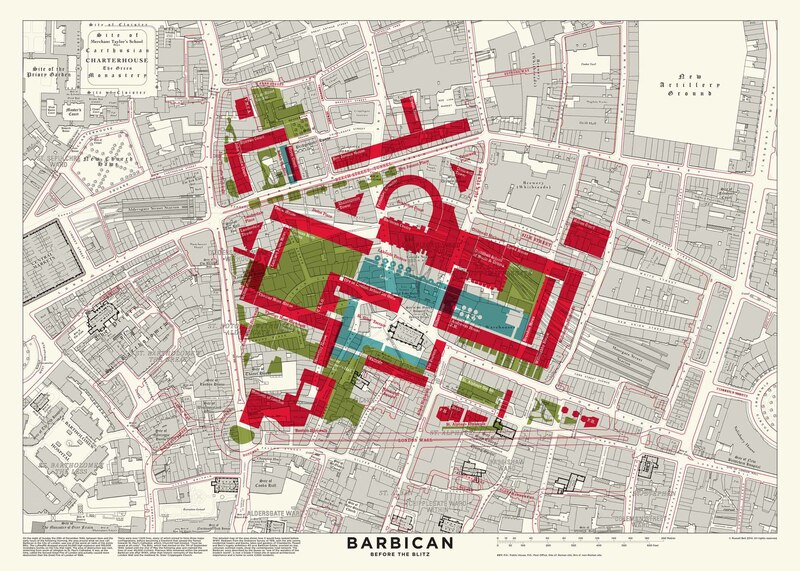 Ever wondered what the Barbican area looked like before the sprawling brutalist complex was built? 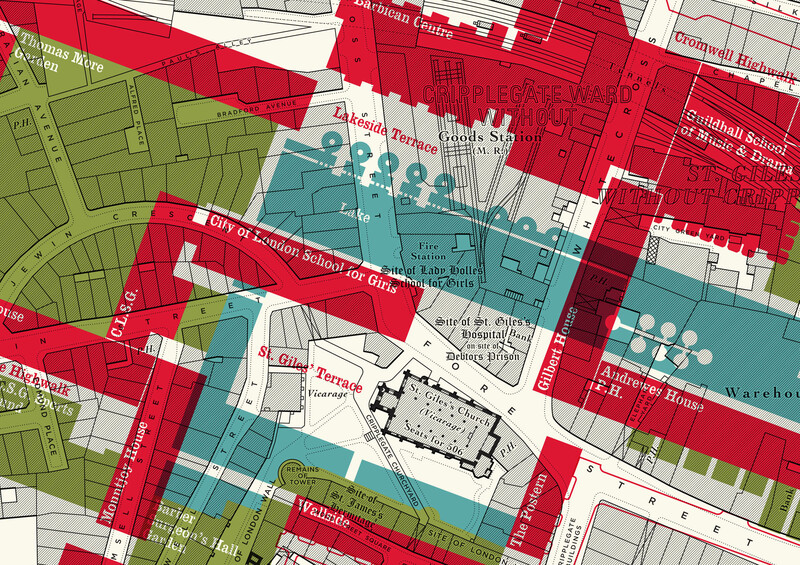 This intriguing map from Russell Bell overlays the modern estate with an Ordnance Survey of 1916, showing just how much the neighbourhood has changed in a century. Cripplegate, as the area was formerly known, was effectively erased from the map on the evening of 29 December 1940, when tens of thousands of bombs and incendiaries were dropped on the City by the Luftwaffe. Hardly a building was left standing in this part of town. 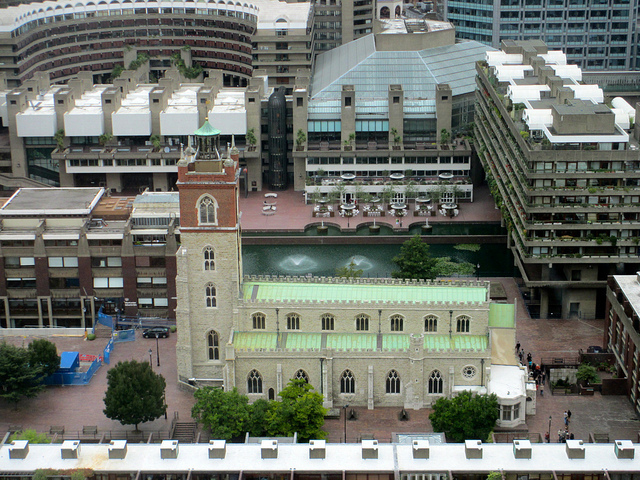 After decades of planning, the new Barbican Estate began to rise in the mid-60s. The estate partly fulfilled a pre-war dream of separating traffic and pedestrians on different levels. In doing so, the 40-acre development almost completely consumed the historic street pattern, as Russell's map shows. If you know the area, this map is fascinating. Whitecross Street, now famed for its street food market, once extended all the way to St Giles's church at the heart of the modern Barbican. Nearby stood a sizeable goods station, where today you might sip a latte on the lakeside terrace. Was the curve of Frobisher Court inspired by the deleted arc of nearby Jewin Crescent? Meanwhile, a fire station that played such an important role in the Blitz would now be submerged beneath the lake. One of the few survivals (though heavily rebuilt) is St Giles Cripplegate. Image by M@. Russell is a resident of the Barbican himself, so knows the area intimately. This protean part of town is again changing. St Alphage Highwalk, seen to the middle bottom of the map, was recently demolished to make way for London Wall Place. Perhaps in a dozen years, the artist might make an updated version, depicting another generation of loss and renewal. You can buy a copy of Barbican Before The Blitz direct from Russell Bell for £85 + p&p.